April 21, 2019 April 21, 2019 Pesso's IcesLeave a Comment on Happy Easter!! 🐣🐰🐇 We are Open today & tomorrow! Enjoy the holiday with some pints of homemade Ices & Ice Cream, and pick up some Gift Cards as an Easter Basket Surprise! April 20, 2019 April 20, 2019 Pesso's IcesLeave a Comment on Have you tried our Homemade Mint Chip Ice Cream? Pesso Jr hand mixes in the delicious Chocolate Chips! April 19, 2019 April 19, 2019 Pesso's IcesLeave a Comment on Happy Passover! We are open all weekend for Passover & Easter! Enjoy the classic holiday treat of Jelly Ring in a delicious Homemade Italian Ice! April 18, 2019 April 18, 2019 Pesso's IcesLeave a Comment on Toppings make any flavor better! Check out our wall of Toppings and add some to your favorite flavors! 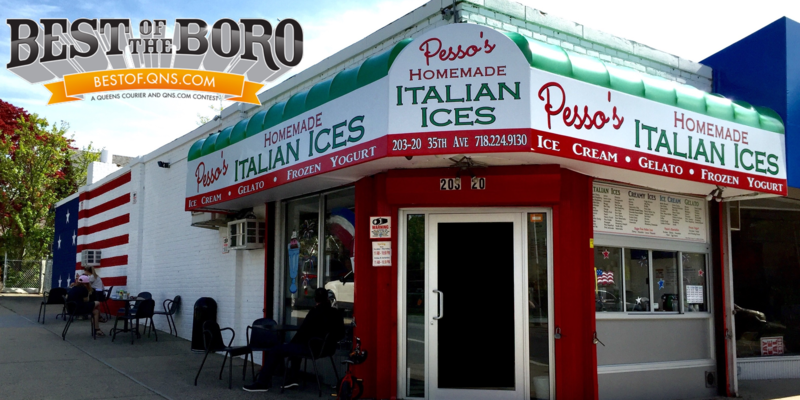 April 16, 2019 April 16, 2019 Pesso's IcesLeave a Comment on Mr. Pesso & his Son are always making fresh batches of all of your favorite flavors, and some new ones! We make everything ourselves right in the back of our store! April 13, 2019 April 13, 2019 Pesso's IcesLeave a Comment on Didn’t get to sit on the #ironthrone? Eat from the Iron Cone, with our brand new #gameofthrones inspired Ice Cream flavor, Game of Cones! Take the Throne, and take home a couple of Pints to eat while watching the Final Season! It’s a Stark White Cream, with a Raspberry Splatter, and Chocolate Covered Waffle Cones. It’s absolutely incredible and it won’t last long! Didn’t get to sit on the #ironthrone? Eat from the Iron Cone, with our brand new #gameofthrones inspired Ice Cream flavor, Game of Cones! Take the Throne, and take home a couple of Pints to eat while watching the Final Season! It’s a Stark White Cream, with a Raspberry Splatter, and Chocolate Covered Waffle Cones. It’s absolutely incredible and it won’t last long! April 12, 2019 April 12, 2019 Pesso's IcesLeave a Comment on Enjoy this sweet Spring day with a cup of our Orange Creamsicle 🍊 Italian Ice! Just like the classic creamy ice pops! Enjoy this sweet Spring day with a cup of our Orange Creamsicle 🍊 Italian Ice! Just like the classic creamy ice pops!